A medicine made from the marijuana plant moved one step closer to U.S. approval Thursday after federal health advisers endorsed it for the treatment of severe seizures in children with epilepsy. If the Food and Drug Administration follows the group's recommendation, GW Pharmaceuticals' syrup would become the first drug derived from the cannabis plant to win federal approval in the U.S. The 13-member FDA panel voted unanimously in favor of the experimental medication made from a chemical found in cannabis—one that does not get users high. The panelists backed the drug based on three studies showing that it significantly reduced seizures in children with two rare forms of childhood epilepsy. "This is clearly a breakthrough drug for an awful disease," said panel member Dr. John Mendelson, of the Friends Research Institute in Baltimore, Maryland. Several patients and parents at Thursday's meeting spoke about the benefits of Epidiolex. Sam Vogelstein, 16, said he experienced daily seizures—at times more than 100 per day— before enrolling in a study of the drug. "I just went to South Africa for two weeks without my parents on a school trip," said Vogelstein, who lives in Berkeley, California. "I would not have been able to do that if I had not tried this medication." It's not yet clear why the medicine reduces seizures. 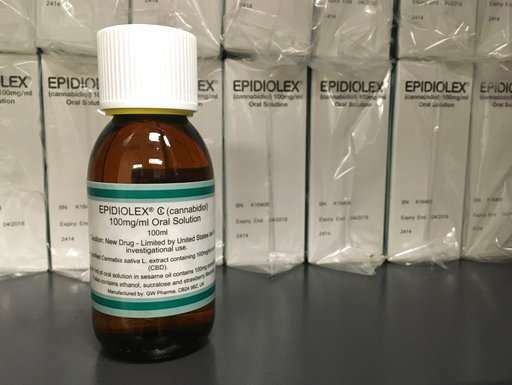 Epidiolex is essentially a pharmaceutical-grade version of cannabidiol, or CBD oil, which some parents have used for years to treat children with epilepsy. CBD is one of more than 100 chemicals found in the cannabis plant and it doesn't contain THC, the ingredient that gives marijuana its mind-altering effect. It's unclear how FDA approval of a CBD drug would affect products already on the market. Executives for the British drugmaker GW Pharmaceuticals say their goal is to provide a more standardized, research-backed version. "We're not looking to impact the availability of other products on the market," GW executive Steve Schultz said before the meeting. "Our goal is to provide an additional option for patients and physicians who desire a purified version of CBD for treatment of seizures."